Along with pressure washing and concrete pouring, we offer multiple services that can improve and extend your home or office’s components. Our professional services are guaranteed and can be taken advantage of individually or in partnership with any of our other offerings. Don’t settle for a less than perfect appearance. For more information about our professional exterior cleaning offered in Waco and Temple, TX, call our consultants at 254-716-8685. 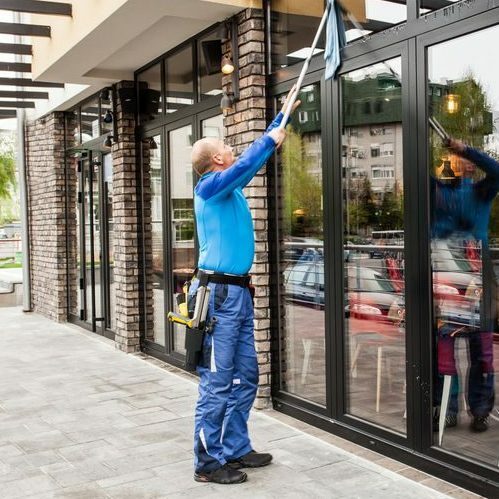 As with all of our offerings, our additional exterior cleaning services are guaranteed to revive the look of your home or business. Our expert technicians work with you, explaining each process and material to ensure that you are always in the loop and completely happy with your end product. We offer services for every budget to keep your home and office beautiful and inviting to maximize traffic. Each of our additional services is completed by our professionally trained team to ensure an impeccable job every time. When you need specialty services, call the team with experience. Call eSquared Asphalt Maintenance at 254-716-8685. Window Washing / Cleaning Find out how window washing can benefit your home or office and how our service differs from the rest. Construction Site Clean-Up Receive comprehensive, knowledgeable cleanup of any size construction site for complete client satisfaction. Roof Gutter Clean Out Service Learn how your gutter protects the most vital component of your home, and how we can help keep them flowing correctly. When performing repairs or projects on your home, mistakes can be costly. Prevent extra expense later by having a professional complete your exterior cleaning today. Our professionals will begin your project by completing a thorough inspection. We will discuss our results including any weaknesses or deficiencies with you, and advise you on repairs or restoration steps in order to minimize damages and cost to you. Our professionals work to provide complete service for your project without cause harm or damage like divots and streaks. The outer area of your business and home is the first thing that patrons and visitors see. Don’t let your home or business’ exterior give the wrong idea about what’s inside. Let our experts help revive and restore it with no hassle to you. For information on all of the benefits of exterior cleaning around Waco and Temple, TX, call our professionals at 254-716-8685 to schedule your consultation.